OMC Members, this newsletter is editable. So let's add your "tells" and pics. I can help you. Contact Super Sue and let's share our wonderful organization. This newsletter will start at the present and move backward from the present. I will do that so that we can put the important Mill Fire situation first. As many of you know, there was a big fire in Mendocino Forest and it hit a lot of the area that we use for our Jackhammer and Sheetiron events. We are concerned about the condition as well as the management of the damage to bring the area back to health and to restore the land back to use in a timely and well-planned manner. I will quote from the letter that Brian Jagger, OMC Member and Enduro Committee Chairman, stated in his letter to Jeannette Williams, Planning Forester with the Mendocino National Forest. To read the entire letter and to find out what you can do tohelp create awareness within the planning committees at the Mendocino NFS, check out this link. We are working closely with the Blue Ribbon Coalition to come together and to make a strong voice on key issues with the planners. Our focus is to protect our beloved OHV trails within the boundaries of the MNF that have brought so much enjoyment over many years. With the proposed logging of the fire=damaged areas comes a threat that our OHV trails can become temporarily or permanently damaged from logging activity in the area. It is important that every person who uses and loves OHV trails make a concerted effort to inform the planners that we want them to ensure that our OHV trails will be retained, protected and returned to us to enjoy. Here is the link to the Blue Ribbon Coalition. From there you will learn what you need to know to make your voice heard. Please be advised that the deadline for public comment for the current scoping period is December 17th, 2012. We urge you to write your comments to the committee as early as possible, however. If you are a member of a motorcycle club and/or a discussion forum, we ask that you share the situation with the members that are in contact with you. If you are a user of social networking sites, such as Facebook, we ask that you post a link to the BRC on your network page. The OMC thanks you for your help from folks like The General who recently blogged about the situation. UPDATE! THANK YOU! As of December 18th 2012, there has been new movement in the right direction. Click here to learn more. Thank you to all who wrote in and had a voice in how the logging project plays out. Club member, Bob Orm, had a serious accident in Feb, 2012, The accident caused serious injury. He was not riding his motorcycle at the time of the accident. Currently, he is in convelescence care at Avalon Care Center in Chowchilla. Tha address is 1010 Ventura Ave, Chowchilla, CA 93610. His phone number is 559-665-4826. If you know Bob and want to see how he's doing, give him a call. He'd love to hear from his friends. Smitty out visiting Bob and sharing his smile with us by taking this pic. OMC Goes hiome on the Big Sur Run via Peach Tree Road to Tres Pinos. The OMC LOVES Flapjacks. It's not a ride south unless we visit. Lindsay's Breakfast Run in Northern Califorina area. Bob is in that video too! 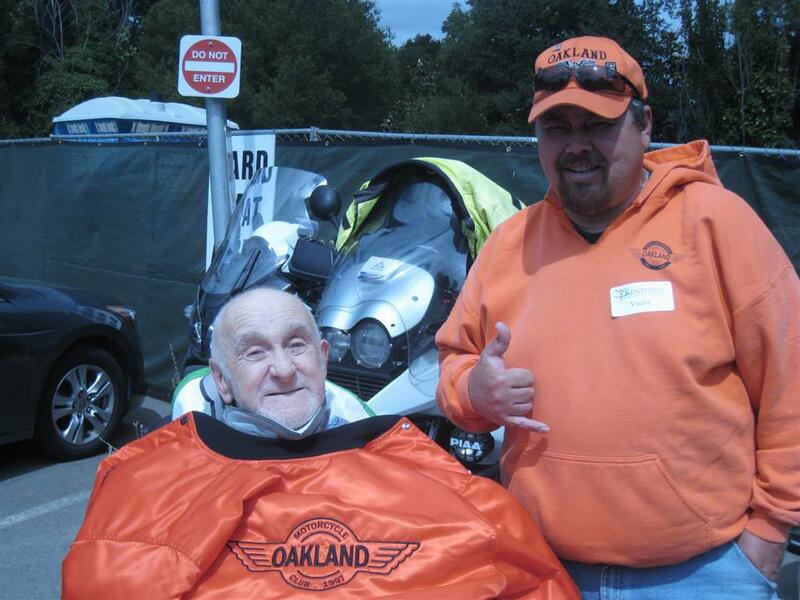 The Oakland Motorcycle Club had another fantastic day out riding together. This ride came from a weekend in May, 2012. The area is super green and full of flowers. It's hit or miss with the fog layer at the coast at this time of the year. In the summer, ,it's almost always "hit" and thick enough to push inland for miles. Not this weekend. It was a bit overcast but overall beautiful weather. Our members who live a little further north in the Petaluma area arranged for a wonderful day. Lindsay had a breakfast waiting for us when we arrived at his home. Paul, Lindsay and John followed up by showing us their local twisties. It was just great! Thank you, OMC, for ANOTHER wonderful weekend. Super Sue and Racey Tracy go to Davis Flats work party day. But first we go to the wine country. OMC Went to Death Valley among many other places this year.